Sean is a successful Entrepreneur with 35 years sales and marketing experience. Sean started his Real Estate Career in 2003 focusing on AG Land Restoration, Land Development and Marketing of Beachfront Properties. He is considered an expert on AG Lands doing over 60 purchases and sales over the past decade on Oahu's North Shore. He also has marketed and sold some of North Shore's most prized beachfront properties and has over $70 million in listings of North Shores most prized ocean front lots. A resident of Diamond Head Kahala area in the 70’s and 80’s. 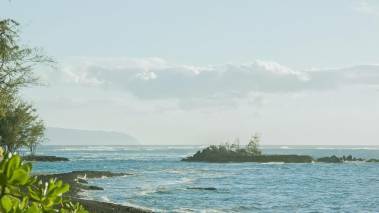 Sean is now involved in the sales and marketing of the 6 remaining Kahala Ave Oceanfront A&B Kawamoto properties that are listed for just over $60 million in total. He is the current Chairman of the North Shore Regional Board of Realtors Group. Sean Ginella's family history in Hawaii goes back to the 1930s when his grandfather James Ginella came to build the dry docks at Pearl Harbor. Sean received his degree in International Relations from Chaminade University in Honolulu. A former Professional Long Board Surfer, Sean settled down to raise a family on the North Shore of Oahu 28 yrs ago. "Sean did excellent work marketing our land. His contacts and coordinating on site with various trades were key to presenting our property in the best possible light. Sean’s market knowledge, presentation and negotiation skills helped us get the price we wanted." "I have known Sean for over 30 years. In addition to being honest and hardworking, he is a community leader, family man, go getter and has changed the face of real estate on the North Shore of Oahu. Sean sold me my dream home on the beach in 2004 and has always been in contact over the years, willing to help if needed for things over and above what a realtor normally does. He then sold this house for me in 2016 with a successful outcome, overcoming hurdles along the way. He never quits and really works to get an honest fair deal done for his clients! Thanks Sean for all you have done for me!" "I have used Sean Ginella for two major real estate purchases over the last couple of years. On both purchases Sean was very responsive to all my communications and needs. He operates on a problem solving basis and deals with the minor problems, that all real estate purchases have, in a calm and relaxed manner. At the same time he gets the job done quickly and efficiently. On my last purchase he really worked hard with me and the seller to come up with a package that worked within my budget. I had a very rigidly set maximum budget and a specific property I wanted to purchase and Sean persisted until he got exactly what I wanted. I won’t hesitate to use Sean next time I have any real estate needs." A Rare Gem Now for Sale at Kawela Bay, on O‘ahu’s North Shore. Open House July 29, 2018.